A year ago I wrote of one the challenges (and pleasures!) of life as a regular blogger for CIO UK - contributing to the development of each year's CIO 100 list, and identifying the winners for announcing at the CIO 100 celebration on April 23. One focus of our discussion is on the effectiveness of each CIO in delivering enterprise performance transformation. And this year, as last, I pointed out that there is in practice an additional transformation agenda that CIOs should also now be addressing. This is the determined transformation of the vendor landscape - its business models and its commercial modus operandi (including its contractual habits). It is what I call proactive market-making. The radical degree to which the IT vendor landscape is transforming is illustrated in a chart published in the Easter edition of The Economist. In its article Opening Windows - Microsoft at middle age there is a presentation of vendor market shares in the US technology sector from 1980 to 2015. 'Back then' Big Blue is dominant (touching 80%) – and over the subsequent 35 years its market share suddenly drops away (1985 onwards) to 5% and sometimes less. Microsoft appears (1990 onwards) hitting 20% as the new Millenium strikes, and then steadily fades to a current 10%. And as we pass 2005, Apple surges into sight, reaching a circa 20% share as the current decade takes root. But what really caught my eye is that, by 2015, two thirds (65%+) of the market is now in the hands of a rapidly growing myriad of other vendors. 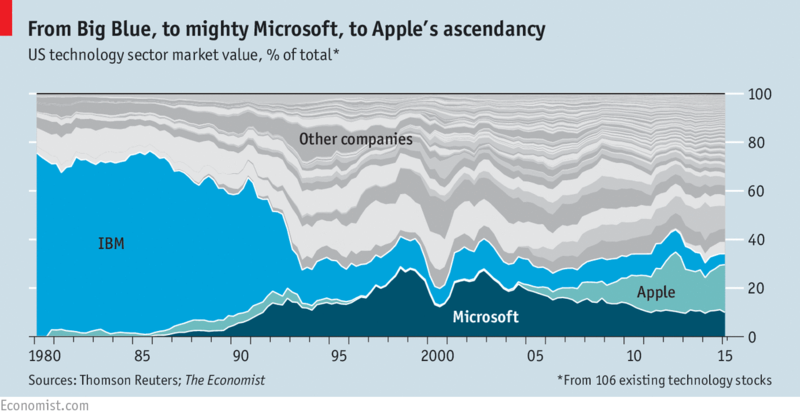 The Economist's graphical analysis is based on 106 existing (quoted) US technology stocks. And we know that in reality the myriad is far far larger. The oligopoly is clearly being broken – and that is why I argue that this is the time for the contemporary CIO to engage in pro-active market making. And for UK CIOs in particular, as the evidence now is that London has, in the last few years, become a major centre for the launch of fast growing, innovative tech ventures, along with such other UK cities as Cambridge and Bristol. Go read Douglas McWilliams' very newly published The Flat White Economy – How the Digital eonomy is Transformimg London and other Cities of the Future. I live and work at Angel, Islington – close by the Old Street roundabout. Douglas McWilliams's eye catching statistic is that, within the single postcode centred around the Old Street tube station, London EC1V, in the two years since the Olympics, 'a digitally-driven explosion' has seen the creation of nearly 32,000 new businesses – and of more new jobs than have been lost in the ravages affecting that neighbouring financial mega-hub, the City of London. McWilliams is a former Chief Economist at the CBI, and then at IBM, now Executive Chairman of Cebr, a leading UK economic consultancy. The trigger for his 'EC1V' analysis was work for London Transport on traffic patterns that alerted him to the major surge in travel (especially by bicycle!) in the area around Old Street. And the Flat White title? Well – the City of London is about massive bonuses, champagne, fast cars and mansions in Knightbridge. The EC1V revolution is about moderate pay, small shared flats in Hackney, bicycles – and the local coffee shops. He is clear that the three key ingredients underwriting the Flat White Economy are: technology, demand and skills. The technology, and the demand, has, in the first place, been the drive into on-line retailing (in Western Europe the UK has been the leader, the fastest in its uptake). The skills? His analysis is that the prime enabler (the UK being IT skill-short) has been our open-borders within the EU, combined with the recessionary environments and restrictive labour practices across the Continent, feeding a flood of young professional talent into East London. It is perhaps a real warning signal to those politicians proposing to restrict immigration. I wrote last month about my experience as a judge for the UK Cloud Awards. The impressive spread of the business models of the young ventures entering the Awards exercise confirms that the 'EC1V revolution' may have been triggered by the drive into on-line retailing, but its innovative front is now, in terms of potential business impact, far wider. So the contemporary CIO should now be taking a proactive role to market-making. The oligopoly is broken. There is a fast developing thrust of young and highly determined tech ventures whose 'offers' spread across the breadth of the requirements of the contemporary enterprise – and they are here in the UK! Research them! Go visit them! Go seek out newer, more innovative and competitive local suppliers to source from! On April 23, at the CIO 100 event, I will once again seek out the proactive market makers! Are you one of them?